Most people will research your firm online before they pick up the phone, writes Garth Brown. When they visit your website, people are trying to figure out whether they like or trust you with their legal work. Increasingly, potential clients place more emphasis on a firm’s digital footprint – the better the footprint, the better likelihood you’ll be selected by a potential client. As an increasing number of professional services are supplied online, e.g. online banking, this trend will only increase. The beauty of digital and online media is that it is relatively simple to continuously improve and refine. Your first website doesn’t need to be perfect – it just needs to be online, yesterday. Here are six steps to help you build an initial website from 20 years of legal experience. When it comes to legal services, people are purchasing “you”. The best way to show who you are is to use video – potential clients want to get a feel about you, what you look and sound like. You should work with an experienced production company to ensure you’re portrayed as friendly, trustworthy and professional. They’ll provide tips and tricks to help you become comfortable in front of the camera, helping you be yourself, be genuine, and project a sense of approachability and warmness in body language. Finally, make sure the video is no longer than 90 seconds. Testimonials display how past clients have commented on your services either in writing or Video testimonial. This page is crucial to any website build. If you don’t have any, contact previous clients for a telephone testimonial. eBooks are a valuable lead magnet and set you up as an expert. Give an overview on your website and offer to send people your eBook in exchange for their email address. After a potential client has downloaded your eBook, contact them a few days later to ask if you can be of any further assistance. Remember, this is most definitely a soft lead – they haven’t agreed to purchase your services. If a potential client uses your material and goes to another firm, you dodged a toxic client. A good client will value your expertise and engage your services as a result. Like a video, your bio page should portray you as friendly and professional. This is also the place to list your qualifications and experiences (a testimonial or two can’t hurt either). And make sure to use professional images. You could also include a story on why you opened your own legal firm, but keep it short. Remember tip one: you want to solve clients’ problems – so tell them what you’re aiming to do for them. Finally, each page on your website should have a clear call to action – ensure the firm’s contact details are visible, as well as links to your social media profiles. 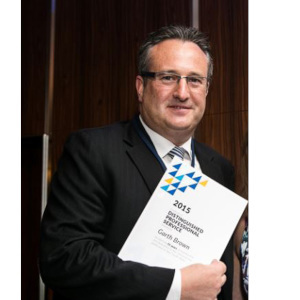 Garth Brown is an award-winning conveyancer and founder of Brown and Brown Conveyancers, based in Sydney. Mr Brown has published conveyancing apps for consumers - "Ask Conveyancer" - and written a series of successful eBooks - "Step by Step Guide to Operating a Successful Conveyancing/Legal Practice". He offers highly professional consultancy services to the industry to assist practitioners ‘how to’ operate their practice more efficiently, profitably and successfully by working less hours and enjoying a satisfying life/work balance.